Born Nov. 25th 1925, Northwest ski pioneer, commercial artist, television personality and loyal Seattleite passed unexpectedly but peacefully in his sleep July 29th, 2017. Roosevelt High School grad, World War II veteran, Purple Heart recipient, and survivor of the “SS Leopoldville” sinking tragedy. Bob attended The Burnley School of Art on the GI Bill, to pursue his dream of becoming a commercial artist. His passion for art, skiing, tennis, golf and the mountains would serve as much of his inspiration, throughout his successful career as an artist. Bob lived life to the fullest, skiing well into his 80’s and golfing within 2 weeks of his passing. His wit, sense of humor and creative artistry were with him to the end. His kindness, generosity and larger than life personality will be missed by all who knew him. Bob was predeceased by Martha, his wife of 63 years and partner in adventures that spanned the globe. He is survived by his three children, Robin Cram Hall (Tim) Sara Cram (Michael) and Doug Cram (Lisa), numerous friends and legions of fans, and his biggest fan club of all, grandchildren Kathleen, Emily, Michelle, Dana and Derek. In lieu of flowers, please make donations to the Washington State Ski and Snowboard Museum or a favorite charity in Bob’s name. A memorial is being planned for mid October, please sign the online guestbook. Bob Cram: What a wonderful human being - what an extraordinary career! It was a great pleasure being his unofficial biographer, although his accomplishments could have filled an entire book. Bob was a good person. It was my good fortune, to first come in contact with Bob circa 1970, to benefit from Bob's friendship and artistic quality. My professional relationship with Chris Wedes and Bob Newman from KIRO 7 TV provided a connection point for my acquaintance with Bob. For a well recognized TV personality and cartoonist, my project seemed frivolous by comparison to the scope of his other clients. My contribution was simply an idea that lacked a vehicle or message. To my relief, Bob expressed a genuine interest and understanding. His grasp of the holistic-ism of Skiing meshed well with my concept of the good life of Skiing. Bob produced seven caricatures, which exist in print to this day, in his unique and singularly audacious style. As our paths crossed over the years Bob would inquire if any upgrades were required. My explanation was that his creations were so perfect that anything more would be less. However, my assurances were given that we used new ink each year. Early on Bob provided me with a more clear understanding of the Skiing experience, I remain in his debt. Bob Cram is a credit to the world of Skiing, you will be missed Remember and pray for those who have gone before us. Bob was one of my favorite people in the world. He was a lot of fun on and off the golf course and, with his droll, deep-voiced delivery and ever-twinkling eyes, one of the best storytellers around. I'll always remember the great times we had with Bob and Martha at Bob Spiwak's annual golf tournament in Mazama. I was very lucky to have known him over the past few decades and wish to send along my thoughts and prayers to the entire Cram clan. That is the end of whimsy as I know it. It was so much fun being with him through the years. I will just miss knowing that he is here. My best wishes to the family. I was saddened to read of Bob's death. I grew up in Seattle in the 60s and 70s and I was an avid fan of his! I loved him on TV, and was an admirer of his art. This obituary brought back a deluge of memories. My thoughts are with you as you mourn the loss of this wonderful man. your very clever, witty and clientele attracting QFC ads will NEVER be forgotten!!! A great tribute to a true Northwest legend and fellow Roosevelt alum! I got to know Bob as a teenager when I was living with Martha's sister Joan and husband Ted in the early 1960's. Both Bob and Martha were such impressive role models for me...they were wonderful examples of how to be gracious and relate socially. Bob was much to be admired in so many diverse areas...and he was certainly wonderful to ski with. I feel very fortunate to have had the privilege of knowing these two world class humans...especially during my formative years, as they had a huge impact on my life. I was hired as a teenager to work for Bob Cram at his Combo Card Co. in the Maritime Building. I checked the greeting cards he illustrated for printer's errors. I found some of them so funny I almost fell off the high stool I sat on . I remember one card with Lady Godiva on her horse with her long hair covering the bare essentials. I babysat for Bob and Martha in the early 60's. I loved being with their bright and lively children Robin, Sara and Doug at their home and the Seattle Tennis Club. Bob was so interesting and funny he would entertain me with his stories while he drove me home. As a young person I was so impressed with the modern home in the woods where Bob and Martha lived. I loved reading their books and listening to Classical music. When Bob was on television it was a delight to watch him. He had such a quick wit and creative mind. His love for Martha and his children was very apparent. Bob was a role model for a life well lived. With the passing of Bob Cram, skiers around the world have lost one of the greatest sources of inspiration and fun surrounding the sport. We will so miss Bob's amazing abilities to bring smiles to everyone's face when he emceed events. Few could match the ease and joy he brought to an event when he took over the mic. The Ancient Skiers and Washington State Ski and Snowboard Museum were just some of the organizations that greatly benefited from his devotion to the sport and his great ability to enhance the camaraderie and smiles of skiers. Dear Robin, Sara and Doug, It is with sad hearts that we learned about your father's passing. We have such fond memories of the years that Tad worked with Bob as associates at Graphic Studios and of the many social gatherings when the wives were present for potlucks at each other's homes. The last time we saw Bob and Martha was when we had breakfast together at University Village, so many years ago. Through a friend at Horizon House, we learned they had moved there, and Bob was very involved and active with the residents. We lost a special creative human being, and we share in your loss. I was just learning to ski in my late-teens when 'Homer Crash-n-Burn' arrived in "The Northwest Skier" and I became a fan for life. Was delighted all over again when Bob Cram became a TV weatherman and brought a hipper vibe to serious local TV newscasts. My pleasure with all things Cram was added to yet again when I discovered, several years after moving into my Wedgwood home in '71, that the Cram family lived only four blocks away (Wow! Proximity to a local celebrity.) The Wedgwood Community Council, in it's various forms over the years, still uses his rendering of the neighborhood's trees as part of their newsletter title. Thank you, Bob Cram, for adding more pleasure and humor to my life. I spent wonderful time with Bob and Martha during my high school years when I lived with my brother Ted Griffin and his wife Joan, Martha Cram's sister. I remember all the special days going to the Mountaineer's lodge and skiing with Bob and the family. Bob was a very helpful, kind man. I have wonderful memories. It was humbling to work for Mr. Cram and his associates at Graphic Studios, way back when. It possibly was the best, and most fun job I’ve ever had. Everyone in that group was so talented in their own right. Bob being one of them. His camaraderie, kindness, and humor really blossomed in his artwork. I still cherish a carved soap stone bird he was thoughtful enough to bring back from one of his many adventures. So thoughtful, and quite the character. My condolences to the Cram family. Bob was an inspiration and friend to all and leaves a huge void in our lives. His untimely death however ended a life lived to the fullest. An old skiing buddy and fellow walker. Bob Cram's passing is a great blow for many of us. Over the years, as an advertising writer and agency creative director I worked with Bob and all of his colleagues at the legendary Graphic Studios. And like countless Seattlelites I enjoyed his work as KING-TVs "Cartooning Weatherman." It would be selling him short however to simply label him a cartoonist; he was a truly accomplished artist in every respect. He was also invariably friendly, good humored, unfailingly ethical, insightful and a wonderful human being. My heart goes our to his family at their great loss. He enriched my life as a colleague in the advertising business, but most of all a friend. What a joy it must have been to be an intimate part of his family. May God grant you all serenity and relieve the grief in your hearts. I was Bob and Martha's CPA for many years until I retired in 2014. After having watched him for many years on Channel 5 I was thrilled to get to know Bob personally. I looked forward to seeing him every tax season. And in fact he was one of the reasons I hesitated about retiring. as clients like him made the work worthwhile. I will treasure the cartoons he gave me over the years and smile every time I look at them. Learned recently of Bob Cram's passing, while visiting a colleague in Seattle. We both had the honor of working with Bob at KING TV, in production, when he served the station as a weatherperson. He radiated goodwill through cartoons. His ski reports represented sun on a rainy day. 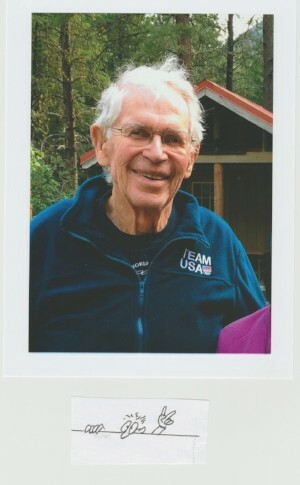 He helped build northwest skiing into a major business, introducing it as an active sport center. Add to this tennis and golf, it's easy to understand him as a full and active person. In a twist of the wrist he created mountains, and made you laugh with the same stroke.. I remember Bob as a person of humor and charity -- clearly a contribution to our greater community. My respects to the family. Thanks Bob for being you. Having known Bob and Martha from when I first met them as ski instructors for the Fiorini's until recently when Bob made a cartoon to support the Mountaineer's Meany Lodge, he has continued to support skiing. His book of cartoons about skiing, where the lift line stretched to the top of the lift has made fun of all the incidents which can happen to skiers. His ski nanny TV show was well watched by most of us whether we skied or not. Thanks Bob got all the fun ideas you gave us snow lovers. Bob Cram was the best! So many wonderful childhood memories with the Cram family. I just looked at a little cartoon he had sent me when my Mom passed away last year - and as usual it made me smile. Our Love goes to the Cram Family, with our gratitude for Bob's tremendous brightness in the skiing world. A ski lift line has never again been a problem, for those of us who recall his unforgettable cartoon. His presence will be missed. Sara, hugs to you all. -- The DePartees: Diane, Dave, Richard and Lil. I remember seeing Bob Cram in KING when i was in diapers in 1968. God speed my friend.